If "once a year" can possible be counted as "fast", here is my annually updated "fast becoming a thing" analysis of the relative popularity of various "competition" Ancients sets in the UK taken as a snapshot right now. For those of you who remember this stuff from last year (and the year before) the key thing is that this is based on actual, observable factual numbers of players taking part in events in the UK - well, those events that have a web footprint of some sort anyway. That means if your local meta, your friendship circle, your local game store or even your Wiccan coven plays something different that's fine - this is just a count of those weird people who enter competitions. And there's certainly been plenty going on! As of today we are just at the end of Year 3 of L'Art de la Guerre as a competition set (it first appeared at Roll Call 2015, with its' first "full season" in 2016), there is a new version of FoG Ancients on the tabletop, MeG is just a few weeks away from its' second anniversary, DBA appears to be having something of a second (third? tenth?) wind right now and - of course - DBM and DBMM are still chugging along too. Well, how does that all look today when you add it all together, shake it about a bit and pour it onto the page? The excellent DBMM rankings website at http://partridges.org.uk/rankings/ has been running at full steam for the last couple of years making the task of capturing all players and games much easier. Last time around there had been 17 DBMM events in the previous 12 months, featuring 84 different players, including a 5-strong overseas contingent (Irish players at Britcon 2016) which meant the UK-based pool was made up of 79 active competition players - unchanged from the previous year. In the 12 months just gone that number of different players has crept up a smidge from 84 to 86, and the number of events has also increased by 1 as well, making a calendar of 18 different competitions for DBMM. So far, so same. What has changed noticeably however is how many entries there have been, as whereas last year the 84 players made 296 entries, this year that's dropped by over 10% to 264. This slowdown in "keen" participation is mirrored by a corresponding increase in the number of "very occasional" players, as 37 of the 86 UK DBMM'ers only entered a single event in the last 12 months - up from 32 "one-timers" in the previous year, and even fewer the year before that. The slightly more committed souls who play in 2 events each year account for a further 14 players, leaving just 35 individuals who are playing in 3 or more UK DBMM events each year. Looking specifically at who those 37 "very occasional" DBMM players are, it's also rather likely that a significant proportion of them are experts at mastering roundabouts (but are possibly scared of motorway driving) given that 18 of them made their only tournament appearance of the year at an event held within 10 miles of Milton Keynes. Another 9 did not venture outside the city limits of Reading to enter an event, which further underlines the continued importance of the WAR and MKWS clubs to DBMM numbers in the UK. The Milton Keynes 1-dayer is now by far and away the biggest event on the DBMM calendar, with 36 entries, followed by Warfare with 32 (across its two 6mm & 15mm periods). Last year I had a graphic showing the stability at the top of the "enthusiasm" pile for DBMM and nothing has really changed since then, with the most established players also being the keenest - in fact, no single player who started playing DBMM after 2012 entered more than 3 events in the last year. In DBMM the "old lags" of the circuit are the enthusiasts, and the "newcomers" appear to be mainly those who are dipping in and out. The current stats also cover the second year after an updated version of DBMM (and all new lists) were published - with almost no change in the overall number of players and a 10% slide in event entries it would however appear the lure of new lists has not encouraged more people to enter events in the UK DBMM community. As last year, the overall DBMM picture remains one of stability, with only a handful of players picking up DBMM to replace the handful of annual dropouts in each of the last few years. If it weren't for the two highly localized Reading and Milton Keynes club-based clusters of players who tend to appear at events organised by their own clubs, the national DBMM scene would however be significantly smaller. In May 2017 FoGAM had just seen a year of steep decline, dropping from 140 players down to just 97. With a new, "faster" version of the rules out at the end of last year (and list books still coming out as we speak) the good news for FoG is that the rate of decline seems to have slowed significantly, as 79 players took pat in one of the 13 UK FoGAM events held in the last 12 months, for a total of 253 total competition entries - pretty close to the same total entries as DBMM, but achieved across 4 fewer events. The answer to why this happened is mostly "Scotland", as the Scottish club circuit has migrated pretty much entirely to ADLG (with a wee smidge of MeG being played in Perth) meaning that the "Schiltron" event dropped out of the FopGAM rankings taking with it 8 unique players and 15 entries from the FoGAM stats this year. Looking further forward to events coming up in the next few months, more existing V2.0 players will reappear on the FoGAM scene as well (based on current signups for future events). By Britcon this will see the UK FoGAM total player pool reach a minimum of at least 54 players. The return of the Northern League as a FoGAM event after a short hiatus may also help drive active player participation up as well. That V3.0 total of 49 includes 7 (yes seven!) new players who have appeared in the rankings for the first time so far this year - pretty much all from the Wessex club(s) who hosted a V3.0 event in February - so FoG is certainly picking up some more new players with V3.0 underway. On the flip side, there are still 30 players in the current "last 12 months" pool who have yet to play a V3.0 event, and quite a few of them have already appeared at events playing other rulesets - whether they stick or twist with these new rulesets is of course yet to be seen. With 17 players still making up half of all competition entries the core group of FoGAM players are just as keen as ever, but on current trends my guess is that FoGAM V3.0 will end the year with something in the region of 60-odd active UK players - arguably comparable to the current DBMM pool if the "MKWS/WAR" bastion of "local-events-only" players was to be adjusted out. Last May MeG was fast approaching it's first full year of UK events, with 31 different players taking part in one of the 5 MeG events held in the 11 months since the release of the ruleset in mid 2016. Since then the number of UK events has increased significantly with 13 competitions being held in the last 12 months. Unsurprisingly the pool of active players has also increased accordingly in the same period, led my a big intake in mid-2017 which saw the total pool of active UK players hit the 50 mark by last year's Britcon. 8 months later the rate of influx into the MeG scene appears to have calmed down a little, with the UK MeG player pool peaking at 65 earlier this year. It now sits on 61 active players entering UK events in the last 12 months (including 2 overseas players) - these 61 have racked up 185 competition entries between them. As one might expect with a still-new ruleset, currently 24 of the 61 players (39%) have only taken part in 1 event so far, and a further 15 only playing in 2 events in their MeG careers to date - hardly surprising with many of these only starting playing MeG competitively this year. MeG also appears to be succeeding in attracting many of it's players from outside of the traditional pool of Ancients gamers - which might be linked to the relatively high proportion of these "toe in the water" 1-2 event players, as many of them will need to collect and paint whole new armies to take part in MeG events. The top tier of active MeG players however is made up of a small number of very, very active players, including many of those who got in at the ground floor as part of the initial "playtester" group. 9 of the 11 playtest pioneers are still very much leading from the front, and still chip in with almost 1/3 of all UK competition entries between them in the last year. Put another way, if you entered a UK MeG event in the last year you had almost a 1 in 3 chance of meeting one of the original playtesters in any given round of any UK event - so if you need help with learning the rules, your opponent may well be perfectly placed to assist! 2 years on from it's launch MeG now boasts a very similar sized UK pool of players to that of the current FoG V3.0 circuit, although a significant proportion of players still at the "dipping their toes in" stage with only 1 or 2 event entries to their name. By comparison the UK ADLG circuit had reached 114 active players and 307 entries by the time it reached the 2-year mark in it's UK evolution. A year ago ADLG had just overtaken DBMM and FoG to become the biggest UK competition ruleset with 122 players taking part and making 331 entries in total across the year. One year on and it's still gaining in popularity, adding 40 new players to the UK circuit to total up 162 players and 499 event entries in the last 12 months - more than DBMM and FoG combined. Part of this has been driven by the emergence of a number of regional mini-circuits in the South West, London, North East and most recently across Scotland, which has resulted in a potentially social-life-destroying 28 separate events taking place across the lengths and breath of the UK in the last year. The size of the UK ADLG circuit is however somewhat inflated by the large number of overseas players who are now regular visitors to these shores to take part in ADLG events. In he last 12 months 19 separate overseas players drawn from all across Europe and further afield entered a UK ADLG event, with even more are set to arrive and be added to that number via the ADLG Worlds at the forthcoming BHGS Challenge this June - an increase of 11 on the previous year's total. There are also 68 "occasional" ADLG players who only making a lone event appearance in the ADLG rankings - 42% of the total, or 32% if you strip out the overseas contingent. This may sound like quite a lot, but is pretty much identical to the equivalent numbers for other rulesets, with 43% for DBMM, 39% for FoGAM and 39% for MeG. Of these, only DBMM has a meaningful number (7) overseas players to impact these percentages, with just 1 overseas player for FoG and 2 for MeG. The Central London Wargames Club remains a hotbed of ADLG contributing 22 players to the rankings. CLWC however only hosted one of its' usually popular 1-day events in the past 12 months, and so the number of CLWC club members who appear in the pool as a result of attending a CLWC event this year is just 6 out of the 22. Competed to the impact of the MKWS and WAR clubs and their local events on the UK DBMM circuit, and now also the Wessex club in FoG 3.0 the importance of CLWC members to the ADLG circuit is now therefore relatively low. DBA has been undergoing something of a renaissance in recent years with a growing competition circuit and more new events taking place as well. In the last 12 months 65 players have taken part in at least 1 DBA event, making up a total of 188 entries, meaning that DBA currently sneaks in just ahead of MeG to claim the prize of being the 4th biggest UK mass battle ruleset as of today - again off the back of 13 events throughout the year. 25 players on the DBA circuit have only entered one event - that proportion of 38% placing it pretty much in line with other rulesets. The full-year total for 2017 was 56 different players, so DBA is seeing a very solid increase in popularity as well so far this year. DBM sits currently on 40 players in the last year entering events in the two geographically spread DBM hotspots of East and West England - these numbers are practically unchangd from last year. Each of the 9 events normally attracts about a dozen players to reach a total of 130 event entries across the year, with the Themed West Country event at 21 being the biggest day out on the circuit. Of the 40 current players, 17 make an appearance in both halves of the country leaving 9 only ever playing on tables which are as flat as their surrounding countryside, and a further 14 who's mid-game cup of tea always comes with a scone and some jam. Launched by Gripping Beast at the end of 2016, initially it seemed as if it might attract a following but based on forum posts there are only likely to be 2-3 UK events this year, with a UK player pool of maybe 20-30. From what's available online, none of these other rulesets support significant numbers of player or events throughout the year in the UK. Simon Miller's To The Strongest may have the largest single pool of players with around 30 attending their main annual event, whilst 7th has a small circuit of 3 events (but failed to gather support to add a 4th earlier this year). Even in aggregate these sets would however fail to trouble the engravers of the "most popular competition ruleset" trophy. The good news is that the number of Ancients events, and the numbers of players entering them is continuing to rise as the continuing uptick in the numbers of people playing new systems is outstripping the ongoing meandering decline in players for other more long in the tooth rulesets. DBx-based games are also still by far the most popular with almost 75% of all UK players choosing a "single-base, single unit" system in preference to "multi-base unit" rulesets. In a development that might either be quite clever indeed, might be a damp squib, or may even be something that I live to regret I've responded to a request by a newbie gamer via Madaxeman.com's Facebook Fan Page (don't laugh..) to come up with a FoGAM army list for a Communal Italian army. Now, given I haven't played AM at 800AP for the best part of 2 years, and I haven't played V2.0 at all this may not exactly be the best army in the world, but it did make me add a brand new page to the FoG Wiki, which as been a little neglected of late. o, now there is an Italian Communal page and list on the Wiki, and it has been generated in response to a request on Facebook... which got me thinking. 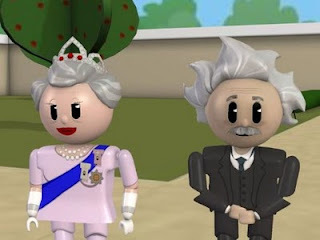 Can I encourage any of you, the 4,000 people who land on Madaxeman.com every month, and who visit 7,000 pages on the Wiki to join in answering this request? That's the theory. Let's all improve the Communal Italian Wiki page. Do you fancy helping ? This is a link to the Wiki Page for the Communal Italian army. If you are registered for the Wiki, just login and contribute something to this Communal Italian page - maybe an army list, but anything will do really as long as it adds to what is already there. Go ahead and add something ! Following up on the Supplier Directory I've now added two sets of pages with listings from "live" eBay Auctions of 15mm Napoleonic troops - covering the UK and US versions of eBay. Both sets of pages cover all the Napoleonic troops currently listed, as well as separate pages for the "Big 5" of France, Britain, Austria, Russia and Prussia. The UK pages can be reached through this link, and the US pages are online here. They include all of the traditional rubbish, some new bits from Twitter and a short video analysis of the Alexandrian army strengths and weaknesses too. 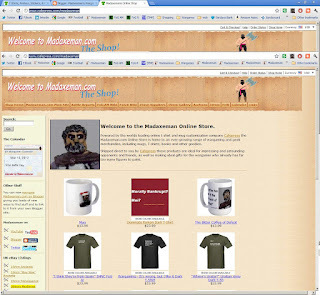 In a development welcomed by literally some people, the Madaxeman.com merchandise shop is back! Yes,your chance to buy t-shirts and mugs with FoG and other wargaming-themed slogans and graphics, wherever you are in the world. The range of products will grow steadily as and when I come up with any ideas (if you have ideas of stuff you'd like designed and produced just email me and I can create them for you), and so keep checking - navigation to The Shop has been added back into the top menu on the main site. This might not rock your world, however let's face it - where else can you buy a t-shirt bearing the slogan "Morally Bankrupt? Moi? Surely some mistake Centurion!" ? FoG:AM after a 1-year break! Thoughts and observations.. I played a game of FoG:AM last night, for the first time in probably over a year (Warfare 2010 was my last competitive game of Ancients). Having been deeply submerged in the world of FoG Renaissance for the past 12 months it was a very interesting experience to get back on the Ancients horse again, and try and compare the two sets from the perspective of FoG:R.
Firstly, it wasn't a "standard" game - instead it was in our club competition which involves 2-hour 650 point games played out on a 4x3 playing surface. My pick for the competition was Han Chinese, selected as I own the army but I don't remember ever using them in FoG Ancients at all (well, certainly not as Chinese... I think some of them have pretended to be Koreans or similar!). My opponent was a Classical Indian army, with rather a lot more units than me (13 to my 8) and who had (also) selected the "Regular" (or is it called "Drilled"?) option for the 9 units of foot bows and warriors in the army. Another interesting angle to the competition is that it is a league, with the same choice of army throughout but the opportunity to change the list each game - so you can pick an army to match up against your opponents choice each game. Knowing I was facing Indians I had therefore elected to take 6 units of armoured foot, 1 skirmishing foot and the compulsory 4 Cavalry - and an IC, giving my army a shield of invulnerability to shooting. I had also picked some portable obstacles, but then found out they had no effect against Elephants (doh!) so that was 27 points wasted straight away! The 4x3 board (with 8"/12" deployment zones and only a 4" "zone of fear" near each edge) certainly reduced the amount of messing around before we got stuck in, although both armies had brought only one unit of skirmishers along anyway. It certainly added weight in my mind to the argument that 800 AP and 6'x4' is not the optimum mix of troop numbers and table size for 15mm FoG:AM games. As a comparison to FoG:R the biggest thing that struck me right from the off, and again and again throughout the game was was just how incredibly maneuverable both sides units of infantry were. With all that drilled medium foot on table, the 1-base sidestep, forming columns, turning and moving sideways and expanding out either side. At times it seemed like we were playing a mega-sized DBA game in which we could just pick up and move the individual bases as we wished, as there seemed to be nothing that these highly trained circus performers could not do! The upshot of this was that in the (rather limited) pre-combat manoeuvring phase of the game I was able to almost totally reorganise my army so the mix of units when the two lines clashed was almost entirely different to that when I deployed - again reminiscent of that bit in a DBx game where a good set of pips allows you to do a huge element-by-element matchup reshuffle just prior to combat. My opponent also did a fair amount of this too, and was only constrained from doing more by the physical logjam of 13 units on a 4' frontage and of course the futility of swapping one 8-strong Bw/Sw infantry unit for another ! Overlaps - counting both ranks - were also a bit of a nasty surprise, as I found myself assuming wrongly that my better quality troops would win out against wider formations of enemy bases. With my own shooting being almost useless (1 rank of crossbows at best...) my game plan relied on doing everything I could to survive the enemy shooting (placing my IC in the right place, working hard to ensure rear support and especially to narrow my units frontage as they charged home) and crossing my fingers, as the opposition rolled lots of dice and hoped for me to fail the Cohesion Tests. The IC played a huge part in surviving the enemy shooting (which is still odd really when you come to think of it) but ultimately this phase of the game was a lot more one-sided than FoG:R as it was all about my opponent rolling lots of dice and hoping I would fail a test - my role was kinda passive. Then, once I had committed my forces to combat it was all about the dice, winning by small margins and hoping to force the enemy to take lots of cohesion tests. This is what decided almost all the combats, as in a mutual destruction (yes!!) I can only remember one (or maybe two?) units breaking from base losses, which is again a massive difference to FoG:R where I suspect most of the broken units in the games I have played in break through base losses rather than three consecutive Cohesion test failures. What was the biggest difference to FoG:R? Out of all the things I've listed, the biggest one I keep coming back to is the extreme, nay, ridiculous ability of (drilled) units to hop,skip, jump and shimmy their way around the table. In FoG:R infantry simply don't do that - formations stay as fixed-width formations (by and large), infantry don't move as far anyway, and they certainly cannot turn and move. That to me makes FoG:R a far, far better game for recreating the look and feel of a historical battle. Having the ability to redeploy pretty much at will (Drilled MF + an IC means you can turn and move on a roll of 5 or more) was kinda fun, but it also meant the rules would have worked almost as well if the bases were representing squadrons of X-wing and Tie-fighters clashing around the gravity well of a rogue planet somewhere in deep space, rather than Han Chinese Close Combat infantry charging home against Indian Longbowmen on the edge of a forest on a battlefield somewhere presumably in the Himalayan foothills! Playing AM at 650 AP on a 4x3 is a lot more fun than chasing LH around a 6x4 - but I think I'll still be sticking with FoG:R for any full-weekend competitions the foreseeable future ! The Marginally Less Morally Bankrupt Dominate Romans enjoy another outing - this time in a damp Augustine Manchester. Read all about it here. Empires of the Dragon released imminently! Get the Big Fat millions of pages book on the Chinese, Samurai and Koreans (and all those chaps on elephants) from Amazon - out on the 10th Sept apparently. I'm running a 1-day mini FoG tourney in London on the 17th of May. Full details via this link. I hope to be playing in a mega-FOG game today (the afternoon of 3rd April) leading the Rugian contingent at Chalons against the Romans. With a bit of luck I may even be posting photos and updates from the game in real time on this page. Looks like everything is 25% off until (I think) the middle or end of January. I've had good service from them in the past, and their Arab-ish Ghilman cavalry mix well with Outpost and Khurasan - see this link - and a lot of their dismounted medieval knights are cool as well. Worth a look? More "from the manufacturer" photos of this oft-overlooked but very nice little range.